One of the drawbacks of my girls getting older is that we no longer visit Build-a-Bear Workshop, which is a shame because we all used to love going. Not only is the process of picking and making your own bear a lovely experience for children but each time we've visited the customer service has been top-notch. It can be a little on the pricey side, but I think for special occasions it's a nice treat so I'm more than happy to promote their latest campaign to support this year's Children in Need appeal. 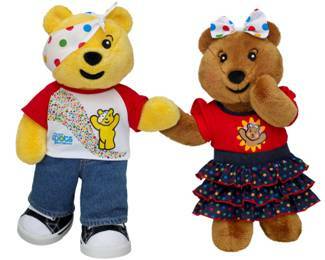 Pudsey and Blush fans are able to make their own BBC Children in Need mascot at any of 55 Build-A-Bear Workshop® stores across the UK with £5 from the sale of each Pudsey and Blush Bear going directly back to the national charity Appeal. An additional £1 from the sale of the t-shirt, slippers, pyjamas and dress will also be donated back to the charity.